"GBP" redirects here. For other uses, see GBP (disambiguation). The pound sterling (symbol: £; ISO code: GBP), commonly known as the pound and less commonly referred to as sterling, is the official currency of the United Kingdom, Jersey, Guernsey, the Isle of Man, South Georgia and the South Sandwich Islands, the British Antarctic Territory, and Tristan da Cunha. It is subdivided into 100 pence (singular: penny, abbreviated: p). A number of nations that do not use sterling also have currencies called the pound. Sterling is the third most-traded currency in the foreign exchange market, after the United States dollar, and the euro. Together with those two currencies and the Chinese yuan, it forms the basket of currencies which calculate the value of IMF special drawing rights. Sterling is also the third most-held reserve currency in global reserves (about 4%). The British Crown dependencies of Guernsey, Jersey and the Isle of Man produce their own local issues of sterling (the Guernsey pound, the Jersey pound and the Manx pound) which are considered fully equivalent to UK sterling in their respective regions. The pound sterling is also used in Gibraltar (alongside the Gibraltar pound), the Falkland Islands (alongside the Falkland Islands pound), Saint Helena and Ascension Island in Saint Helena, Ascension and Tristan da Cunha (alongside the Saint Helena pound). The Bank of England is the central bank for the pound sterling, issuing its own banknotes, and regulating issuance of banknotes by private banks in Scotland and Northern Ireland. Banknotes issued by other jurisdictions are not regulated by the Bank of England; local governments use Bank of England notes as backing for local issuance by allowing them to be exchanged 1:1 at face value. The full official name pound sterling (plural: pounds sterling), is used mainly in formal contexts and also when it is necessary to distinguish the United Kingdom currency from other currencies with the same name. Otherwise the term pound is normally used. The currency name is sometimes abbreviated to just sterling, particularly in the wholesale financial markets, but not when referring to specific amounts; for example, "Payment is accepted in sterling" but never "These cost five sterling". The abbreviations "ster." and "stg." are sometimes used. The term "British pound" is sometimes incorrectly used in less formal contexts, and it is not an official name of the currency. The exchange rate of the pound sterling against the US dollar is referred to as "cable" in the wholesale foreign exchange markets. The origins of this term are attributed to the fact that in the 1800s, the GBP/USD exchange rate was transmitted via transatlantic cable. Forex traders of GBP/USD are sometimes referred to as "cable dealers". GBP/USD is now the only currency pair with its own name in the foreign exchange markets, after IEP/USD, known as "wire" particularly in the forward FX markets, no longer exists after the Irish Pound was replaced by the euro in 1999. For further discussion of the etymology of "sterling", see sterling silver. The currency sign for the pound is £, which is usually written with a single cross-bar (as on sterling bank notes), though a version with a double cross-bar (₤) is also sometimes seen. This symbol derives from medieval Latin documents; the Roman words libra, solidus, and denarius (£sd) referred to pounds, shillings and pence in the British pre-decimal (duodecimal) currency system and the black-letter "L" was the abbreviation for libra, the basic Roman unit of weight. The ISO 4217 currency code is GBP, formed from "GB", the ISO 3166-1 alpha-2 code for the United Kingdom, and the first letter of "pound". It does not stand for "Great Britain Pound" or "Great British Pound". Occasionally, the abbreviation "UKP" is used but this is non-standard because the ISO 3166 country code for the United Kingdom is GB (see Terminology of the British Isles). The Crown dependencies use their own (non-ISO) codes: GGP (Guernsey pound), JEP (Jersey pound) and IMP (Isle of Man pound). Stocks are often traded in pence, so traders may refer to pence sterling, GBX (sometimes GBp), when listing stock prices. A common slang term for the pound sterling or pound is quid, which is singular and plural, except in the common phrase "quids in!". The term may have come via Italian immigrants from "scudo", the name for a number of coins used in Italy until the 19th century; or from Latin 'quid' via the common phrase quid pro quo, literally, "what for what", or, figuratively, "An equal exchange or substitution". Since decimalisation on Decimal Day in 1971, the pound has been divided into 100 pence (denoted on coinage, until 1981, as "new pence"). The symbol for the penny is "p"; hence an amount such as 50p (£0.50) properly pronounced "fifty pence" is more colloquially, quite often, pronounced "fifty pee" /fɪfti pi/. This also helped to distinguish between new and old pence amounts during the changeover to the decimal system. A decimal halfpenny was issued until 1984, but was removed due to having a higher cost to manufacture than its face value. Before decimalisation, the pound was divided into 20 shillings and each shilling into 12 pence, making 240 pence to the pound. The symbol for the shilling was "s."—not from the first letter of the word, but from the Latin solidus. The symbol for the penny was "d.", from the French denier, from the Latin denarius (the solidus and denarius were Roman coins). A mixed sum of shillings and pence, such as 3 shillings and 6 pence, was written as "3/6" or "3s. 6d." and spoken as "three and six" or "three and sixpence" except for "1/1," "2/1" etc., which were spoken as "one and a penny", "two and a penny", etc.). 5 shillings, for example, was written as "5s." or, more commonly, "5/–". Various coin denominations had, and in some cases continue to have, special names—such as crown, farthing, sovereign and guinea. See Coins of the pound sterling and List of British coins and banknotes for details. By the 1950s, coins of Kings George III, George IV and William IV had disappeared from circulation, but coins (at least the penny) bearing the head of any British king or queen from Queen Victoria onwards could be found in circulation. Silver coins were replaced by those in cupro-nickel in 1947, and by the 1960s the silver coins were rarely seen. Silver/cupro-nickel shillings (from any period after 1816) and florins (2 shillings) remained as legal tender after decimalisation (as 5p and 10p respectively) until 1993, but are now officially demonetised. At various times, the pound sterling was commodity money or bank notes backed by silver or gold, but it is currently fiat money, backed only by the economy in the areas where it is accepted. The pound sterling is the world's oldest currency still in use and which has been in continuous use since its inception. The pound was a unit of account in Anglo-Saxon England, equal to 240 silver pennies and equivalent to one pound weight of silver. It evolved into the modern British currency, the pound sterling. The accounting system of 4 farthings = 1 penny, 12 pence = 1 shilling, 20 shillings = 1 pound was adopted from that introduced by Charlemagne to the Frankish Empire (see French livre). The origins of sterling lie in the reign of King Offa of Mercia (757–796), who introduced the silver penny. It copied the denarius of the new currency system of Charlemagne's Frankish Empire. 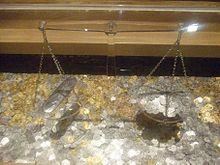 As in the Carolingian system, 240 pennies weighed 1 pound (corresponding to Charlemagne's libra), with the shilling corresponding to Charlemagne's solidus and equal to 12d. At the time of the penny's introduction, it weighed 22.5 troy grains of fine silver (32 tower grains; about 1.5 g), indicating that the Mercian pound weighed 5,400 troy grains (the Mercian pound became the basis of the tower pound, which also weighed 5,400 troy grains, equivalent to 7,680 tower grains, about 350g). The early pennies were struck from fine silver (as pure as was available). However, in 1158, a new coinage was introduced by King Henry II (known as the Tealby penny) which was struck from 0.925 (92.5%) silver. This became the standard until the 20th century and is today known as sterling silver, named after its association with the currency. Sterling silver is harder than the 0.999 (99.9%) fine silver that was traditionally used, and so sterling silver coins did not wear down as rapidly as fine silver coins. The English currency was almost exclusively silver until 1344, when the gold noble was successfully introduced into circulation. However, silver remained the legal basis for sterling until 1816. During the time of Henry III, the pound sterling equalled the tower (weight) pound. In the 28th year of Edward I (around 1300), the tale (money) pound, or pound sterling, first began to differ from (weigh less than) the tower pound, from which it originated, for by indenture[clarification needed] of that year the pound weight was to contain 20s. 3d. in tale pound. :14 In the 27th year of Edward III (around 1354), the pound sterling was now only 80% of the pound weight, or 9 oz 12 dwt (or 9.6 oz) tower. :15 By an Act of 13 Henry IV[which?] (around 1412), the pound weight of standard silver was to contain thirty shillings in tale, or one and a half pounds sterling; thus the pound sterling reduced to two-thirds of a pound weight, or 8 oz tower. :18 The pound sterling was adjusted in weight several more times thereafter. In the reign of Henry IV (1399–1413), the penny was reduced in weight to 15 grains (0.97 g) of silver, with a further reduction to 12 grains (0.78 g) in 1464. During the reigns of Henry VIII and Edward VI, the silver coinage was drastically debased, although the pound was redefined to the troy pound of 5,760 grains (373 g) in 1526. In 1544, a silver coinage was issued containing just one-third silver and two-thirds copper—equating to .333 silver, or 33.3% pure. The result was a coin copper in appearance but relatively pale in colour. In 1552, a new silver coinage was introduced, struck in sterling silver. However, the penny's weight was reduced to 8 grains (0.52 g), so 1 troy pound of sterling silver produced 60 shillings of coins. This silver standard was known as the "60-shilling standard" and lasted until 1601 when a "62-shilling standard" was introduced, reducing the penny's weight to ​7 23⁄31 grains (0.50 g). Throughout this period, the size and value of the gold coinage fluctuated considerably. In 1663, a new gold coinage was introduced based on the 22 carat fine guinea. Fixed in weight at ​44 1⁄2 to the troy pound from 1670, this coin's value varied considerably until 1717, when it was fixed at 21 shillings (21/-, 1.05 pounds). However, despite the efforts of Sir Isaac Newton, Master of the Mint, to reduce the guinea's value, this valuation overvalued gold relative to silver when compared to the valuations in other European countries. In line with Gresham's Law, British merchants sent silver abroad in payments whilst goods for export were paid for with gold. As a consequence of these flows of silver out and gold in, Great Britain was effectively on a gold standard. Trade with China aggravated this outflow, as the Chinese refused to accept anything but silver in payment for exports. From the mid-17th century, around 28,000 metric tons (27,600 imperial tons) of silver were received by China, principally from European powers, in exchange for Chinese tea and other goods. In order to trade with China, Great Britain had first to trade with the other European nations to receive silver, which led to the East India Company redressing this trade imbalance through the indirect sale of opium to the Chinese. 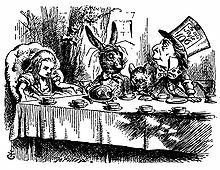 Domestic offtake further reduced silver in circulation, as the improving fortunes of the merchant class led to increased demand for tablewares. Silversmiths had always regarded coinage as a source of raw material, already verified for fineness by the government. As a result, sterling coins were being melted and fashioned into sterling silverware at an accelerating rate. A 1697 Act of Parliament tried to stem this tide by raising the minimum acceptable fineness on wrought plate from sterling's 92.5% to a new Britannia silver standard of 95.83%. Silverware made purely from melted coins would be found wanting when the silversmith took his wares to the Assay Office, thus discouraging the melting of coins. The Bank of England was founded in 1694, followed by the Bank of Scotland a year later. Both began to issue paper money. The pound Scots once had much the same value as the pound sterling, but it suffered far higher devaluation until in the 17th century it was pegged to sterling at a value of 12 pounds Scots = 1 pound sterling. In 1707, the Kingdom of England and the Kingdom of Scotland merged to form the Kingdom of Great Britain. In accordance with the Treaty of Union, the currency of Great Britain was sterling, with the pound Scots soon being replaced by sterling at the pegged value. 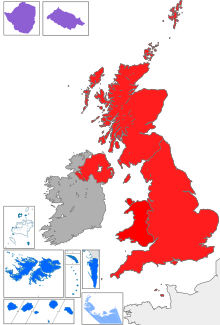 In 1801, Great Britain and the Kingdom of Ireland were united to form the United Kingdom of Great Britain and Ireland. However, the Irish pound continued to exist and was not replaced by sterling until January 1826. The conversion rate had long been thirteen Irish pounds to twelve pounds sterling. The Irish pound was readopted in 1928, six years after the Anglo-Irish Treaty restored Irish independence. Sterling circulated in much of the British Empire. In some parts, it was used alongside local currencies. For example, the gold sovereign was legal tender in Canada despite the use of the Canadian dollar. Several colonies and dominions adopted the pound as their own currency. These included Australia, Barbados, British West Africa, Cyprus, Fiji, British India, the Irish Free State, Jamaica, New Zealand, South Africa and Southern Rhodesia. Some of these retained parity with sterling throughout their existence (e.g. the South African pound), whilst others deviated from parity after the end of the gold standard (e.g. the Australian pound). These currencies and others tied to sterling constituted the sterling area. The original English colonies on mainland North America were not party to the sterling area because the above-mentioned silver shortage in England coincided with these colonies' formative years. As a result of equitable trade (and rather less equitable piracy), the Spanish milled dollar became the most common coin within the English colonies. During the American war of independence and the Napoleonic wars, Bank of England notes were legal tender, and their value floated relative to gold. The Bank also issued silver tokens to alleviate the shortage of silver coins. In 1816, the gold standard was adopted officially, with the silver standard reduced to 66 shillings (66/-, £3 6s)[clarification needed], rendering silver coins a "token" issue (i.e. not containing their value in precious metal). In 1817, the sovereign was introduced, valued at 20 shillings. Struck in 22‑carat gold, it contained 113 grains (7.3 g) of gold and replaced the guinea as the standard British gold coin without changing the gold standard. In 1825, the Irish pound, which had been pegged to sterling since 1801 at a rate of 13 Irish pounds = 12 pounds sterling, was replaced, at the same rate, with sterling. By the 19th century the pound sterling was widely accepted outside Britain. The American Nellie Bly carried Bank of England notes on her 1889–1890 trip around the world in 72 days. During the late 19th and early 20th centuries, many other countries adopted the gold standard. As a consequence, conversion rates between different currencies could be determined simply from the respective gold standards. The pound sterling was equal to 4.85 United States dollars, 5.25 Canadian dollars, 12.10 Dutch guilders, 26.28 French francs (or equivalent currencies in the Latin Monetary Union), 20.43 German marks or 24.02 Austro-Hungarian krone. After the International Monetary Conference of 1867 in Paris, the possibility of the UK joining the Latin Monetary Union was discussed, and a Royal Commission on International Coinage examined the issues, resulting in a decision against joining monetary union. The gold standard was suspended at the outbreak of the war in 1914, with Bank of England and Treasury notes becoming legal tender. Before World War I, the United Kingdom had one of the world's strongest economies, holding 40% of the world's overseas investments. But after the end of the war, the country was indebted: Britain owed £850 million (£37.3 billion as of 2015) with interest costing the country some 40% of all government spending. To try to resume stability, a version of the gold standard was reintroduced in 1925, under which the currency was fixed to gold at its pre-war peg, but one could only exchange currency for gold bullion, not for coins. This was abandoned on 21 September 1931, during the Great Depression, and sterling suffered an initial devaluation of some 25%. In 1940, an agreement with the US pegged the pound to the U.S. dollar at a rate of £1 = $4.03. (Only the year before, it had been $4.86.) This rate was maintained through the Second World War and became part of the Bretton Woods system which governed post-war exchange rates. Under continuing economic pressure, and despite months of denials that it would do so, on 19 September 1949 the government devalued the pound by 30.5% to $2.80. The move prompted several other currencies to be devalued against the dollar. Operation Bernhard was the codename of a secret Nazi plan devised during the Second World War by the RSHA and the SS to destabilise the British economy via economic warfare by flooding the global economy and the British Empire with forged Bank of England £5, £10, £20, and £50 notes. In 1961, 1964, and 1966, the pound came under renewed pressure, as speculators were selling pounds for dollars. In summer 1966, with the value of the pound falling in the currency markets, exchange controls were tightened by the Wilson government. Among the measures, tourists were banned from taking more than £50 out of the country in travellers' cheques and remittances, plus £15 in cash; this restriction was not lifted until 1979. The pound was devalued by 14.3% to $2.40 on 18 November 1967. Until decimalisation, amounts were stated in pounds, shillings, and pence, with various widely understood notations. The same amount was denoted by 32s 6d, 32/6, £1 12s 6d, £1/12/6. It was customary to specify some prices (for example professional fees and auction prices for works of art) in guineas (one guinea was 21 shillings) although guinea coins were no longer in use. Formal parliamentary proposals to decimalise sterling were first made in 1824 when Sir John Wrottesley, MP for Staffordshire, asked in the British House of Commons whether consideration had been given to decimalising the currency. Wrottesley raised the issue in the House of Commons again in 1833, and it was again raised by John Bowring, MP for Kilmarnock Burghs, in 1847 whose efforts led to the introduction in 1848 of what was in effect the first decimal coin in the United Kingdom, the florin, valued at one-tenth of a pound sterling. However, full decimalisation was resisted, although the florin coin, re-designated as ten new pence, survived the transfer to a full decimal system in 1971, with examples surviving in British coinage until 1993. John Benjamin Smith, MP for Stirling Burghs, raised the issue of full decimalisation again in Parliament in 1853, resulting in the Chancellor of the Exchequer, William Gladstone, announcing soon afterwards that "the great question of a decimal coinage" was "now under serious consideration". A full proposal for the decimalisation of sterling was then tabled in the House of Commons in June 1855, by William Brown, MP for Lancashire Southern, with the suggestion that the pound sterling be divided into one thousand parts, each called a "mil", or alternatively a farthing, as the pound was then equivalent to 960 farthings which could easily be rounded up to one thousand farthings in the new system. This did not result in the conversion of the pound sterling into a decimal system, but it was agreed to establish a Royal Commission to look into the issue. However, largely due to the hostility to decimalisation of two of the appointed commissioners, Lord Overstone (a banker) and John Hubbard (Governor of the Bank of England), decimalisation in Britain was effectively quashed for over a hundred years. However, the pound sterling was decimalised in various British colonial territories before the United Kingdom (and in several cases in line with William Brown's proposal that the pound be divided into 1,000 parts, called mils). These included Hong Kong from 1863 to 1866; Cyprus from 1955 until 1960 (and continued on the island as the division of the Cypriot pound until 1983); and the Palestine Mandate from 1926 until 1948. Towards the end of the Second World War, various attempts to decimalise the pound sterling in the United Kingdom were made. Later, in 1966, the British government decided to include in the Queen's Speech a plan to convert the pound into a decimal currency. As a result of this, on 15 February 1971, the UK decimalised the pound sterling, replacing the shilling and penny with a single subdivision, the new penny. For example, a price tag of £1 12s 6d became ​£1.62 1⁄2. The word "new" was omitted from coins minted after 1981. 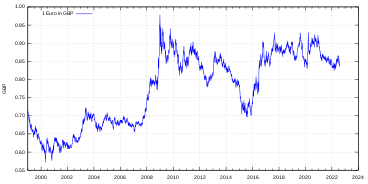 With the breakdown of the Bretton Woods system, the pound floated from August 1971 onwards. At first it appreciated a little, rising to almost $2.65 in March 1972 from $2.42, the upper bound of the band in which it had been fixed. The sterling area effectively ended at this time, when the majority of its members also chose to float freely against the pound and the dollar. James Callaghan became Prime Minister in 1976. He was immediately told the economy was facing huge problems, according to documents released in 2006 by the National Archives. The effects of the 1973 oil crisis were still being felt, with inflation rising to over 27% in 1975. Financial markets were beginning to believe the pound was overvalued, and in April that year The Wall Street Journal advised the sale of sterling investments in the face of high taxes, in a story that ended with "goodbye, Great Britain. It was nice knowing you". At the time the UK government was running a budget deficit, and Labour's strategy emphasised high public spending. Callaghan was told there were three possible outcomes: a disastrous free fall in sterling, an internationally unacceptable siege economy, or a deal with key allies to prop up the pound while painful economic reforms were put in place. The US government feared the crisis could endanger NATO and the European Economic Community (EEC), and in light of this the US Treasury set out to force domestic policy changes. In November 1976 the International Monetary Fund (IMF) announced the conditions for a loan, including deep cuts in public expenditure. The Conservative Party was elected to office in 1979, on a programme of fiscal austerity. Initially the pound rocketed, moving above US$2.40, as interest rates rose in response to the monetarist policy of targeting money supply. 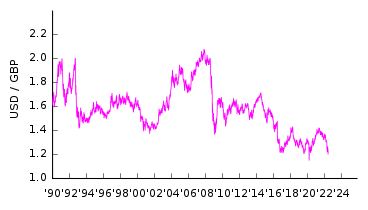 The high exchange rate was widely blamed for the deep recession of 1981. Sterling fell sharply after 1980; at its lowest, the pound stood at just $1.03 in March 1985, before rising to $1.70 in December 1989. Following German reunification in 1990, the reverse held true, as high German borrowing costs to fund Eastern reconstruction, exacerbated by the political decision to convert the Ostmark to the DM on a 1:1 basis, meant that interest rates in other countries shadowing the DM, especially the UK, were far too high relative to domestic circumstances, leading to a housing decline and recession. On 8 October 1990 the Conservative government (Third Thatcher ministry) decided to join the European Exchange Rate Mechanism (ERM), with the pound set at DM2.95. However, the country was forced to withdraw from the system on "Black Wednesday" (16 September 1992) as Britain's economic performance made the exchange rate unsustainable. 'Black Wednesday' saw interest rates jump from 10% to 15% in an unsuccessful attempt to stop the pound from falling below the ERM limits. The exchange rate fell to DM2.20. Those who had argued for a lower GBP/DM exchange rate were vindicated as the cheaper pound encouraged exports and contributed to the economic prosperity of the 1990s. In 1997, the newly elected Labour government handed over day-to-day control of interest rates to the Bank of England (a policy that had originally been advocated by the Liberal Democrats). The Bank is now responsible for setting its base rate of interest so as to keep inflation (as measured by the Consumer Price Index (CPI)) very close to 2% per annum. Should CPI inflation be more than one percentage point above or below the target, the governor of the Bank of England is required to write an open letter to the Chancellor of the Exchequer explaining the reasons for this and the measures which will be taken to bring this measure of inflation back in line with the 2% target. On 17 April 2007, annual CPI inflation was reported at 3.1% (inflation of the Retail Prices Index was 4.8%). Accordingly, and for the first time, the Governor had to write publicly to the government explaining why inflation was more than one percentage point higher than its target. As a member of the European Union, the United Kingdom could have adopted the euro as its currency. However, the subject was always politically controversial, and the UK negotiated an opt-out on this issue. In 2007, Gordon Brown, then Chancellor of the Exchequer, ruled out membership for the foreseeable future, saying that the decision not to join had been right for Britain and for Europe. On 1 January 2008, with the Republic of Cyprus switching its currency from the Cypriot pound to the euro, the British sovereign bases on Cyprus (Akrotiri and Dhekelia) followed suit, making the Sovereign Base Areas the only territory under British sovereignty to officially use the euro. The 2016 referendum which started the process of United Kingdom's withdrawal from the European Union makes adoption of the euro extremely unlikely. The government of former Prime Minister Tony Blair had pledged to hold a public referendum to decide on adoption of the Euro should "five economic tests" be met, to increase the likelihood that any adoption of the euro would be in the national interest. In addition to these internal (national) criteria, the UK would have to meet the European Union's economic convergence criteria (Maastricht criteria) before being allowed to adopt the euro. The Conservative and Liberal Democrat coalition government (2010–2015) ruled out joining the euro for that parliamentary term. Currently,[when?] the UK's annual government deficit, as a percentage of the GDP, is above the defined threshold. The idea of replacing the pound with the euro was always controversial with the British public, partly because of the pound's identity as a symbol of British sovereignty and because it would, according to many critics, have led to suboptimal interest rates, harming the British economy. In December 2008, the results of a BBC poll of 1000 people suggested that 71% would vote no to the euro, 23% would vote yes, while 6% said they were unsure. The pound did not join the Second European Exchange Rate Mechanism (ERM II) after the euro was created. Denmark and the UK have opt-outs from entry to the euro. Theoretically, every other EU nation must eventually sign up. The Scottish Conservative Party claimed that there was an issue for Scotland in that the adoption of the euro would mean the end of nationally distinctive banknotes, as the euro banknotes do not have national designs. Before the 'No' vote in the Scottish independence referendum in 2014, the Scottish National Party affirmed that the euro would not be the national currency of an independent Scotland. The cost of one pound in US dollars (from 1990). The cost of one Euro in pounds (from 1999). The pound and the euro fluctuate in value against one another, although there may be correlation between movements in their respective exchange rates with other currencies such as the US dollar. Inflation concerns in the UK led the Bank of England to raise interest rates in late 2006 and 2007. This caused the pound to appreciate against other major currencies and, with the US dollar depreciating at the same time, the pound hit a 15-year high against the US dollar on 18 April 2007, reaching US$2 the day before, for the first time since 1992. The pound and many other currencies continued to appreciate against the dollar; sterling hit a 26-year high of US$2.1161 on 7 November 2007 as the dollar fell worldwide. From mid-2003 to mid-2007, the pound/euro rate remained within a narrow range (€1.45 ± 5%). Following the global financial crisis in late 2008, the pound depreciated sharply, reaching $1.38 (US) on 23 January 2009 and falling below €1.25 against the euro in April 2008. There was a further decline during the remainder of 2008, most dramatically on 29 December when its euro rate hit an all-time low at €1.0219, while its US dollar rate depreciated. The pound appreciated in early 2009, reaching a peak against the euro of €1.17 in mid-July. In the following months the pound remained broadly steady against the euro, with the pound's valued on 27 May 2011 at €1.15 and US$1.65. On 5 March 2009, the Bank of England announced that it would pump £75 billion of new capital into the British economy, through a process known as quantitative easing (QE). This was the first time in the United Kingdom's history that this measure had been used, although the Bank's Governor Mervyn King suggested it was not an experiment. The process saw the Bank of England creating new money for itself, which it then used to purchase assets such as government bonds, secured commercial paper, or corporate bonds. The initial amount stated to be created through this method was £75 billion, although Chancellor of the Exchequer Alistair Darling had given permission for up to £150 billion to be created if necessary. It was expected that the process would continue for three months, with results only likely in the long term. By 5 November 2009, some £175 billion had been injected using QE, and the process remained less effective in the long term. In July 2012, the final increase in QE meant it had peaked at £375 billion, then holding solely UK Government bonds, representing one third of the UK national debt. The result of the 2016 UK referendum on EU membership caused a major decline in the pound against other world currencies as the future of international trade relationships and domestic political leadership became unclear. The referendum result weakened sterling against the euro by 5% overnight. The night before the vote, the pound was trading at €1.30; the next day, this had fallen to €1.23. By October 2016, the exchange rate was €1.12 to the pound, a fall of 14% since the referendum. By the end of August 2017 the pound was even lower, at €1.08. Against the US dollar, meanwhile, the pound fell from $1.466 to $1.3694 when the referendum result was first revealed, and down to $1.2232 by October 2016, a fall of 16%. The Bank of England had stated in 2009 that the decision had been taken to prevent the rate of inflation falling below the 2% target rate. Mervyn King, the Governor of the Bank of England, had also suggested there were no other monetary options left, as interest rates had already been cut to their lowest level ever (0.5%) and it was unlikely that they would be cut further. The inflation rate rose in following years, reaching 5.2% per year (based on the Consumer Price Index) in September 2011, then decreased to around 2.5% the following year. The silver penny (plural: pence; abbreviation: d) was the principal and often the only coin in circulation from the 8th century until the 13th century. Although some fractions of the penny were struck (see farthing and halfpenny), it was more common to find pennies cut into halves and quarters to provide smaller change. Very few gold coins were struck, with the gold penny (worth 20 silver pence) a rare example. However, in 1279, the groat, worth 4d, was introduced, with the half groat following in 1344. 1344 also saw the establishment of a gold coinage with the introduction (after the failed gold florin) of the noble worth six shillings and eight pence (6/8) (i.e. 3 nobles to the pound), together with the half and quarter noble. Reforms in 1464 saw a reduction in value of the coinage in both silver and gold, with the noble renamed the ryal and worth 10/- (i.e. 2 to the pound) and the angel introduced at the noble's old value of 6/8. The reign of Henry VII saw the introduction of two important coins: the shilling (abbr. : s; known as the testoon) in 1487 and the pound (known as the sovereign, abbr. : £ or L) in 1489. In 1526, several new denominations of gold coins were added, including the crown and half crown worth five shillings (5/-), and two shillings and six pence (2/6, two and six) respectively. Henry VIII's reign (1509–1547) saw a high level of debasement which continued into the reign of Edward VI (1547–1553). This debasement was halted in 1552, and a new silver coinage was introduced, including coins for 1d, 2d, 3d, 4d and 6d, 1/-, 2/6 and 5/-. In the reign of Elizabeth I (1558–1603), silver ​3⁄4d and ​1 1⁄2d coins were added, but these denominations did not last. Gold coins included the half-crown, crown, angel, half-sovereign and sovereign. Elizabeth's reign also saw the introduction of the horse-drawn screw press to produce the first "milled" coins. Following the succession of the Scottish King James VI to the English throne, a new gold coinage was introduced, including the spur ryal (15/-), the unite (20/-) and the rose ryal (30/-). The laurel, worth 20/-, followed in 1619. The first base metal coins were also introduced: tin and copper farthings. Copper halfpenny coins followed in the reign of Charles I. During the English Civil War, a number of siege coinages were produced, often in unusual denominations. Following the restoration of the monarchy in 1660, the coinage was reformed, with the ending of production of hammered coins in 1662. The guinea was introduced in 1663, soon followed by the ​1⁄2, 2 and 5 guinea coins. The silver coinage consisted of denominations of 1d, 2d, 3d, 4d and 6d, 1/-, 2/6 and 5/-. Due to the widespread export of silver in the 18th century, the production of silver coins gradually came to a halt, with the half crown and crown not issued after the 1750s, the 6d and 1/- stopping production in the 1780s. In response, copper 1d and 2d coins and a gold ​1⁄3 guinea (7/-) were introduced in 1797. The copper penny was the only one of these coins to survive long. To alleviate the shortage of silver coins, between 1797 and 1804, the Bank of England counterstamped Spanish dollars (8 reales) and other Spanish and Spanish colonial coins for circulation. A small counterstamp of the King's head was used. Until 1800, these circulated at a rate of 4/9 for 8 reales. After 1800, a rate of 5/- for 8 reales was used. The Bank then issued silver tokens for 5/- (struck over Spanish dollars) in 1804, followed by tokens for 1/6 and 3/- between 1811 and 1816. In 1816, a new silver coinage was introduced in denominations of 6d, 1/-, 2/6 (half-crown) and 5/- (crown). The crown was only issued intermittently until 1900. It was followed by a new gold coinage in 1817 consisting of 10/- and £1 coins, known as the half sovereign and sovereign. The silver 4d coin was reintroduced in 1836, followed by the 3d in 1838, with the 4d coin issued only for colonial use after 1855. In 1848, the 2/- florin was introduced, followed by the short-lived double florin in 1887. In 1860, copper was replaced by bronze in the farthing (quarter penny, ​1⁄4d), halfpenny and penny. During the First World War, production of the sovereign and half-sovereign was suspended, and although the gold standard was later restored, the coins saw little circulation thereafter. In 1920, the silver standard, maintained at .925 since 1552, was reduced to .500. In 1937, a nickel-brass 3d coin was introduced; the last silver 3d coins were issued seven years later. In 1947, the remaining silver coins were replaced with cupro-nickel, with the exception of Maundy coinage which was then restored to .925. Inflation caused the farthing to cease production in 1956 and be demonetised in 1960. In the run-up to decimalisation, the halfpenny and half-crown were demonetised in 1969. Elizabeth II English rose, Welsh leek, Scottish thistle, and Northern Irish shamrock. 1968: The first decimal coins were introduced. These were cupro-nickel 5p and 10p coins which were equivalent to, and circulated alongside, the one shilling coin and the two shilling or florin coin respectively. 1969: The curved equilateral heptagonal cupro-nickel 50p coin replaced the 10/- note. 1971: The decimal coinage was completed when decimalisation came into effect in 1971 with the introduction of the bronze ​1⁄2p, 1p and 2p coins and the withdrawal of the 1d and 3d coins. 1980: Withdrawal of 6d coins, which had circulated at a value of ​2 1⁄2p. 1982: The word "new" was dropped from the coinage and a 20p coin was introduced. 1983: A £1 coin was introduced. 1983: The ​1⁄2p coin was last produced. 1984: The ​1⁄2p coin was withdrawn from circulation. 1990: The crown, worth 25p, was re-tariffed for future issues as a commemorative coin at £5. 1990s: The 5p, 10p and 50p coins became smaller. 1991: Pre-decimal 1/- coins, which had continued to circulate with a value of 5p, were withdrawn from circulation in 1991 after the 5p coin became smaller. At the same time larger first generation decimal 5p coins were withdrawn from circulation. 1992: Bronze was replaced with copper-plated steel. 1993: Pre-decimal 2/- coins, or florin, a legacy of the 1848 attempt at decimalisation were withdrawn from circulation. At the same time larger first generation decimal 10p coins were withdrawn from circulation. 1998: The bi-metallic £2 coin was introduced. 2007: By now the value of copper in the pre-1992 1p and 2p coins (which are 97% copper) exceeded those coins' face value to such an extent that melting down the coins by entrepreneurs was becoming worthwhile (with a premium of up to 11%, with smelting costs reducing this to around 4%)—although this is illegal, and the market value of copper has subsequently fallen dramatically from these earlier peaks. In April 2008, an extensive redesign of the coinage was unveiled. The 1p, 2p, 5p, 10p, 20p and 50p coins feature parts of the Royal Shield on their reverse; and the reverse of the pound coin showed the whole shield. The coins were issued gradually into circulation, starting in mid-2008. They have the same sizes, shapes and weights as those with the old designs which, apart from the round pound coin which was withdrawn in 2017, continue to circulate. 2012: The 5p and 10p coins were changed from cupro-nickel to nickel-plated steel. 2017: A more secure twelve-sided £1 coin was introduced to reduce forgery. The old round £1 coin ceased to be legal tender on 15 October 2017. At present, the oldest circulating coins in the UK are the 1p and 2p copper coins introduced in 1971. No other coins from before 1982 are in circulation. Prior to the withdrawal from circulation of the larger 10p in 1993, the oldest circulating coins had usually dated from 1947: although older coins (shilling; florin, sixpence to 1980) were still legal tender, inflation meant that their silver content was worth more than their face value, which meant that they tended to be removed from circulation. Before decimalisation in 1971, a handful of change might have contained coins 100 or more years old, bearing any of five monarchs' heads, especially in the copper coins. The first sterling notes were issued by the Bank of England shortly after its foundation in 1694. Denominations were initially handwritten on the notes at the time of issue. From 1745, the notes were printed in denominations between £20 and £1000, with any odd shillings added by hand. £10 notes were added in 1759, followed by £5 in 1793 and £1 and £2 in 1797. The lowest two denominations were withdrawn after the end of the Napoleonic wars. In 1855, the notes were converted to being entirely printed, with denominations of £5, £10, £20, £50, £100, £200, £300, £500 and £1000 issued. The Bank of Scotland began issuing notes in 1695. Although the pound Scots was still the currency of Scotland, these notes were denominated in sterling in values up to £100. From 1727, the Royal Bank of Scotland also issued notes. Both banks issued some notes denominated in guineas as well as pounds. In the 19th century, regulations limited the smallest note issued by Scottish banks to be the £1 denomination, a note not permitted in England. With the extension of sterling to Ireland in 1825, the Bank of Ireland began issuing sterling notes, later followed by other Irish banks. These notes included the unusual denominations of 30/- and £3. The highest denomination issued by the Irish banks was £100. In 1826, banks at least 65 miles (105 km) from London were given permission to issue their own paper money. From 1844, new banks were excluded from issuing notes in England and Wales but not in Scotland and Ireland. Consequently, the number of private banknotes dwindled in England and Wales but proliferated in Scotland and Ireland. The last English private banknotes were issued in 1921. In 1914, the Treasury introduced notes for 10/- and £1 to replace gold coins. These circulated until 1928, when they were replaced by Bank of England notes. Irish independence reduced the number of Irish banks issuing sterling notes to five operating in Northern Ireland. The Second World War had a drastic effect on the note production of the Bank of England. Fearful of mass forgery by the Nazis (see Operation Bernhard), all notes for £10 and above ceased production, leaving the bank to issue only 10/-, £1 and £5 notes. Scottish and Northern Irish issues were unaffected, with issues in denominations of £1, £5, £10, £20, £50 and £100. The Bank of England reintroduced £10 notes in 1964. In 1969, the 10/- note was replaced by the 50p coin to prepare for decimalisation. £20 Bank of England notes were reintroduced in 1970, followed by £50 in 1981. A £1 coin was introduced in 1983, and Bank of England £1 notes were withdrawn in 1988. Scottish and Northern Irish banks followed, with only the Royal Bank of Scotland continuing to issue this denomination. UK notes include raised print (e.g. on the words "Bank of England"); watermarks; embedded metallic thread; holograms; and fluorescent ink visible only under UV lamps. Three printing techniques are involved: offset litho, intaglio and letterpress; and the notes incorporate a total of 85 specialized inks. The Bank of England produces notes named "giant" and "titan". A giant is a one million pound note, and a titan is a one hundred million pound bank note, of which there are about 40. Giants and titans are used only within the banking system. The £5 polymer banknote, issued by Northern Bank (now Danske Bank) in 2000, was the only polymer note in circulation until 2016, although Danske Bank also produces paper-based £10, £20 and £50 notes. The Bank of England introduced £5 polymer banknotes in September 2016, and the paper £5 notes were withdrawn on 5 May 2017. This date was picked due to its short format, 5/5. A polymer £10 banknote was introduced on 14 September 2017, and the paper note was withdrawn on 1 March 2018. A polymer £20 banknote will be introduced in 2020. As the central bank of the United Kingdom which has been delegated authority by the government, the Bank of England sets the monetary policy for the British pound by controlling the amount of money in circulation. It has a monopoly on issuance of banknotes in England and Wales, and regulates the amount of banknotes issued by seven authorized banks in Scotland and Northern Ireland. HM Treasury has reserve powers to give orders to the committee "if they are required in the public interest and by extreme economic circumstances" but such orders must be endorsed by Parliament within 28 days. Unlike banknotes which have separate issuers in Scotland and Northern Ireland, all UK coins are issued by the Royal Mint, which is an independent enterprise (wholly owned by the Treasury) which also mints coins for other countries. In Britain's Crown Dependencies, the Manx pound, Jersey pound, and Guernsey pound are unregulated by the Bank of England and are issued independently. However, they are maintained at a fixed exchange rate by their respective governments, and Bank of England notes have been made legal tender on the islands, forming a sort of one-way de facto currency union. These currencies do not have ISO 4217 codes so "GBP" is usually used to represent all of them; informal codes are used where the difference is important. British Overseas Territories are responsible for the monetary policy of their own currencies (where they exist), and have their own ISO 4217 codes. The Falkland Islands pound, Gibraltar pound, and Saint Helena pound are set at a fixed 1:1 exchange rate with the British pound by local governments. The British Islands (red) and overseas territories (blue) using the Pound or their local issue. Legal tender in the United Kingdom is defined such that "a debtor cannot successfully be sued for non-payment if he pays into court in legal tender." Parties can alternatively settle a debt by other means with mutual consent. Strictly speaking it is necessary for the debtor to offer the exact amount due as there is no obligation for the other party to provide change. Throughout the UK, £1 and £2 coins are legal tender for any amount, with the other coins being legal tender only for limited amounts. Bank of England notes are legal tender for any amount in England and Wales, but not in Scotland or Northern Ireland. (Bank of England 10/- and £1 notes were legal tender, as were Scottish banknotes, during World War II under the Currency (Defence) Act 1939, which was repealed on 1 January 1946.) Channel Islands and Isle of Man banknotes are legal tender only in their respective jurisdictions. Bank of England, Scottish, Northern Irish, Channel Islands, Isle of Man, Gibraltar, and Falkland banknotes may be offered anywhere in the UK, although there is no obligation to accept them as a means of payment, and acceptance varies. For example, merchants in England generally accept Scottish and Northern Irish bills, but some unfamiliar with them may reject them. However, Scottish and Northern Irish bills both tend to be accepted in Scotland and Northern Ireland, respectively. Merchants in England generally do not accept Jersey, Guernsey, Isle of Man, Gibraltar, and Falkland notes but Isle of Man notes are generally accepted in Northern Ireland. Bank of England notes are generally accepted in the Falklands and Gibraltar, but for example Scottish and Northern Irish notes are not. Since all of the bills are denominated in pounds sterling, banks will exchange them for locally issued bills at face value, though some in the UK have had trouble exchanging Falkland Islands pounds. Commemorative £5 and 25p (crown) coins, rarely seen in circulation, are legal tender, as are the bullion coins issued by the Mint. In 2006, the House of Commons Library published a research paper which included an index of prices in pounds for each year between 1750 and 2005, where 1974 was indexed at 100. Regarding the period 1750–1914 the document states: "Although there was considerable year on year fluctuation in price levels prior to 1914 (reflecting the quality of the harvest, wars, etc.) there was not the long-term steady increase in prices associated with the period since 1945". It goes on to say that "Since 1945 prices have risen in every year with an aggregate rise of over 27 times". The value of the index in 1751 was 5.1, increasing to a peak of 16.3 in 1813 before declining very soon after the end of the Napoleonic Wars to around 10.0 and remaining in the range 8.5–10.0 at the end of the 19th century. The index was 9.8 in 1914 and peaked at 25.3 in 1920, before declining to 15.8 in 1933 and 1934—prices were only about three times as high as they had been 180 years earlier. Inflation has had a dramatic effect during and after World War II: the index was 20.2 in 1940, 33.0 in 1950, 49.1 in 1960, 73.1 in 1970, 263.7 in 1980, 497.5 in 1990, 671.8 in 2000 and 757.3 in 2005. The following table shows the equivalent amount of goods and services that, in a particular year, could be purchased with £1. The table shows that from 1971 to 2015 the British pound lost about 92% of its buying power. The smallest coin in 1971 was the ​1⁄2p, worth about 6.4p in 2015 prices. The pound is freely bought and sold on the foreign exchange markets around the world, and its value relative to other currencies therefore fluctuates. As of 27 August 2017[update], £1 was worth US$1.289, €1.0808, ¥141, CHF 1.22329, A$1.6247, C$1.6083 or INR 82.50. Sterling is used as a reserve currency around the world and is currently ranked fourth in value held as reserves. ^ "The Silver Six Pence 2016 UK - The Royal Mint". www.royalmint.com. Archived from the original on 20 January 2018. Retrieved 19 January 2018. ^ "£1,000 gold Kilo Coin marks Queen's Diamond Jubilee". ITV News. 1 June 2012. Retrieved 28 July 2014. ^ "British Indian Ocean Territory Currency". Wwp.greenwichmeantime.com. 2 August 2013. Retrieved 28 July 2014. ^ Alongside Zimbabwean dollar (suspended indefinitely from 12 April 2009), Euro, US Dollar, South African rand, Botswana pula, Indian rupees, Australian dollars, Chinese yuan, and Japanese yen . The U.S. Dollar has been adopted as the official currency for all government transactions. ^ "sterling | Definition of sterling in English by Oxford Dictionaries". Oxford Dictionaries | English. Retrieved 22 January 2019. ^ "Foreign and Commonwealth Office country profiles: British Antarctic Territory". British Foreign & Commonwealth Office. 25 March 2010. Archived from the original on 20 April 2009. Retrieved 17 April 2010. ^ "Foreign and Commonwealth Office country profiles: Tristan da Cunha". British Foreign & Commonwealth Office. 12 February 2010. Archived from the original on 30 June 2010. Retrieved 17 April 2010. ^ Jeff Desjardins (29 December 2016). "Here are the most traded currencies in 2016". Business Insider. Retrieved 30 June 2017. ^ "Der Dollar verliert an "Reservestatus"" [The dollar loses its reserve status]. Frankfurter Allgemeine Zeitung (in German). Frankfurt. 3 January 2011. Retrieved 14 February 2014. ^ "Cable Definition". Investopedia. Retrieved 28 July 2014. ^ a b "sterling, n.1 and adj.". OED Online. December 2011. Oxford University Press. Entry 189985. Retrieved 28 February 2012. ^ "Easterling theory". Sterling Judaica. n.d. Retrieved 19 February 2014. ^ "Sterling". Online Etymology Dictionary. n.d. Retrieved 19 February 2014. ^ "A myth with a silver lining". The Grammarphobia Blog. 25 June 2011. Retrieved 19 February 2014. ^ a b "Pound sterling (money)". Encyclopædia Britannica. 13 August 2013. Retrieved 19 February 2014. ^ Grierson, Philip. Anglo-Saxon Coins: Studies Presented to F.M. Stenton on the Occasion of His 80th Birthday, 17 May, 1960, edited by R.H.M. Dolley. Taylor & Francis. pp. 266–283. GGKEY:1JURCGTRPJ8. Retrieved 28 February 2012. ^ Family, Commerce, and Religion in London and Cologne. Retrieved 16 September 2016. ^ The Journal of the Manchester Geographical Society, Volumes 19-20. Retrieved 16 September 2016. ^ The American Heritage Dictionary of the English Language, Third Edition. Houghton Mifflin. 20 August 1992. ^ "1984: Halfpenny coin to meet its maker". BBC News. 2008. Retrieved 14 February 2014. ^ Rendall, Alasdair (12 November 2007). "Economic terms explained". BBC News. Retrieved 14 February 2014. ^ a b c d A View of the Silver Coin and Coinage of England. p. ii. Retrieved 19 September 2016. ^ Bloy, Marjie (20 June 2006). "British Currency before 1971". The Victorian Web. Retrieved 28 December 2010. ^ Layton, Thomas N. (1997). The Voyage of the 'Frolic': New England Merchants and the Opium Trade. Stanford University Press. p. 28. ISBN 9780804729093. ^ "The Central Bank of Barbados: Students' Centre – Money: Bits and Pieces". Centralbank.org.bb. Archived from the original on 14 June 2008. Retrieved 17 April 2010. ^ Bly, Nellie (1890). "1". Around the World in Seventy-Two Days. The Pictorial Weeklies Company. ^ "Investment > World Gold Council". Gold.org. 26 July 2011. Retrieved 22 December 2011. ^ "The Interest Burden of Inter-Government Debts". The Economic World. 110: 342. 2 September 1922. ^ A History of the Canadian Dollar, p. 51. ^ a b c Nevin, Louis (3 October 1976). "How the British pound plummeted". Spokesman-Review. (Spokane, Washington). Associated Press. p. E2. ^ "British devalue pound, ask $1 million loan". Spokesman-Review. (Spokane, Washington). Associated Press. 19 November 1967. p. 1, sec. 1. ^ Casciani, Dominic (29 December 2006). "Crisis threatened nuclear weapons". BBC News. Retrieved 17 April 2010. ^ "The Cabinet Papers – Global oil shortage". The National Archives. Retrieved 22 December 2010. ^ Martin, Iain (2 December 2009). "Brutal Realism and the Promise of Better Times". The Wall Street Journal. New York. Retrieved 14 February 2014. ^ Burk, Kathleen; Cairncross, Alec (19 February 1992). Goodbye, Great Britain: The 1976 IMF Crisis. Yale University Press. ISBN 0-300-05728-8. ^ Samson, Rob (5 January 2015). "GBP Forecast to See Support at 1.40 v US Dollar, But 1983 Lows a Step Too Far". Pound Sterling Live. Retrieved 30 January 2015. ^ Keegan, William (26 October 2003). "Sometimes it can pay to break the rules". The Observer. London. Retrieved 14 February 2014. ^ Wren-Lewis, Simon, et al, 1991. "Evaluating the U.K.'s Choice of Entry Rate into the ERM," The Manchester School of Economic & Social Studies, University of Manchester, vol. 59(0), pages 1-22, Supplemen. ^ "Budget Statement". Parliamentary Debates (Hansard). House of Commons. 2 July 1997. col. 303–303. ^ "Rate hike fear as inflation jumps". BBC News. 17 April 2007. Retrieved 17 April 2010. ^ "Should Britain join the euro?". The Daily Telegraph. London. 12 May 2003. Retrieved 14 February 2014. ^ "Most Britons 'still oppose euro'". BBC News. 1 January 2009. Retrieved 17 April 2010. ^ "Protesters pursue Hague". BBC News. 19 May 2000. Retrieved 17 April 2010. ^ "Pound reaches 26-year dollar high". BBC News. 18 April 2007. Retrieved 17 April 2010. ^ "GBPUSD=X: Basic Chart for GBP/USD – Yahoo! Finance". Finance.yahoo.com. Retrieved 17 April 2010. ^ "ECB ratings: Pound sterling in Euros". European Central Bank. Retrieved 17 April 2010. ^ "Pound hits new low against euro". BBC News. 29 December 2008. Retrieved 17 April 2010. ^ "Historical rates". Oanda Corporation. 16 April 2011. Retrieved 6 November 2011. ^ a b "Bank to pump £75bn into economy". BBC News. 5 March 2009. Retrieved 5 March 2009. ^ a b "ECB, Bank of England cut rates to record lows". CNN. 6 March 2009. Retrieved 6 March 2009. ^ Meaden, Sam (6 April 2013). "Bank of England, Asset Purchase Facility – Results". Bank of England. Retrieved 6 April 2013. ^ Lawrence, Colin. "Exchange Rates Today: British Pound Slumps Vs Euro, Dollar As UK Services Hits Record Low". Exchange Rates UK - Live Coverage of the British Pound & Other G10 Currencies. ^ "British Pound (GBP) to Euro (EUR) exchange rate history". www.exchangerates.org.uk. ^ "British Pound (GBP) to US Dollar (USD) exchange rate history". www.exchangerates.org.uk. ^ Rogers, Simon; Sedghi, Ami (12 November 2013). "UK inflation since 1948". The Guardian. London. Retrieved 14 February 2014. ^ "The new 12-sided £1 coin". The New Pound Coin. The Royal Mint. Archived from the original on 8 July 2017. Retrieved 8 July 2017. ^ Higginbotham, Adam. "The inkjet counterfeiter (Wired UK)". Wired.co.uk. Retrieved 28 July 2014. ^ Bowlby, Chris (26 January 2013). "Britain's £1m and £100m banknotes". BBC News. Retrieved 14 February 2014. ^ "Security by Design – A closer look at Bank of England notes" (PDF). Bank of England. Retrieved 6 November 2011. ^ "Moving to Polymer Banknotes | Bank of England". www.bankofengland.co.uk. Retrieved 3 October 2017. ^ "The Bank of England's Role in Regulating the Issuance of Scottish and Northern Ireland Banknotes". Bank of England. Retrieved 28 July 2014. ^ "Act of Parliament gives devolved responsibility to the MPC with reserve powers for the Treasury". Opsi.gov.uk. Retrieved 10 May 2010. ^ "Other British Islands' Notes". Bank of England. Retrieved 28 July 2014. ^ "Can I use coinage from United Kingdom Overseas Territories?". Royalmint.com. 11 July 2014. Archived from the original on 14 June 2017. Retrieved 28 July 2014. ^ "Legal Tender Guidelines". Royal Mint. Retrieved 13 May 2014. ^ "Legal Tender Guidelines". Royalmint.com. 11 July 2014. Retrieved 28 July 2014. ^ "Can I use coins from Guernsey, Jersey, Gibraltar and the Isle of Man in the United Kingdom? Why are they made to the same specifications as British coins?". www.royalmintmuseum.org.uk. Retrieved 5 July 2018. ^ King, Mark (12 September 2012). "Can I spend Scottish money in England?". The Guardian. London. Retrieved 28 July 2014. ^ "Currency used in Northern Ireland". www.discoveringireland.com. Retrieved 5 July 2018. ^ "Foreign travel advice: Gibraltar". Retrieved 23 March 2014. ^ "100 Falkland Island Pounds to GBP". Retrieved 10 August 2018. ^ "Foreign travel advice: Falkland Islands". Retrieved 24 March 2014. ^ "British Royal Mint – What are the legal tender amounts acceptable for the United Kingdom coins?". Archived from the original on 10 March 2014. Retrieved 10 March 2014. ^ "Legal Tender Guidelines". The Royal Mint. ^ Webb, Dominic (13 February 2006). Inflation: the value of the pound 1750–2005 (PDF) (Report). House of Commons Library. Retrieved 17 April 2010. ^ O'Donoghue, Jim; Goulding, Louise; Allen, Grahame (March 2004). "Consumer Price Inflation since 1750" (PDF). Economic Trends. Office for National Statistics (604): 38–46. ISBN 0-11-621671-9. ISSN 0013-0400. Retrieved 14 February 2014. ^ "Measuring Worth – Purchasing Power of Money in the United Kingdom from 1971 to 2009". Archived from the original on 3 April 2010. Retrieved 22 April 2010. ^ "Historic inflation calculator". Retrieved 12 May 2015. "Bank of England Banknotes FAQ". Retrieved 7 May 2006. Wikimedia Commons has media related to Pound Sterling. This page was last edited on 20 April 2019, at 13:20 (UTC).